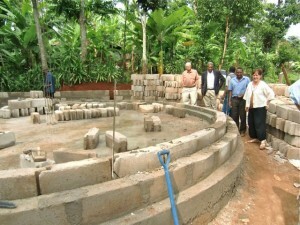 Minnesota partner, Jim Thomas, Pastor Kleopa, Alphonse, Michael & Barbara appreciating the cistern foundation. In all my life I could never have imagined that a water cistern would become a ‘beautiful sight’. But in ways that are nothing short of God given and mysterious, I am now moved to tears by the Grandfather Cistern taking form in Kyaseni Village. 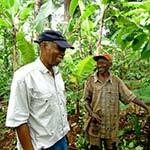 Engineer & good friend Tingi with land donor Antony. Mr. Antony Ngowi donated a piece of his precious land where the cistern is taking form, to ‘honor his father and his father’s father and their fathers’. He is deeply happy to be an important part of gifting the Uru community with clean water. He is also providing a watchful eye during construction, as well as a wide smile and a warm embrace, to all who come to visit and marvel at the cistern taking form. A happy moment with technician Michael, Jean and Project Manager Alphonse. The circular cistern has become a symbol of hope and an affirmation of perseverance for not only the surrounding community, but for recent visitors, too. Our friends and partners in a new water borehole project being developed in Kikatiti stood quietly with us during a recent tour, imagining such a reality for the families and school kids challenged by drought and high fluoride in their Meru mountain area. Antony’s grandsons Baracka & Amani enjoy the visitors and building activity. Long time partners Rev. Sandy and Jean from Eau Claire Wisconsin came a long way too, to stand at the cistern. They were reminded once again that the part they and their church community have played over the years through prayer and fundraising, has created health and hope for Uru people. 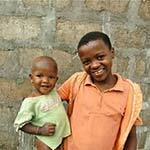 Baby Salome and her sister share wide smiles. 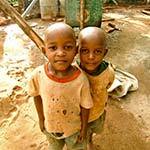 On completion of the cistern, the amount of available clean water will double and be made available to twice as many people. So Jim and I come to watch the cement being mixed by diligent ‘fundi’s’. We stand and laugh with the village children, who are endlessly entertained by the construction and visitors in their midst. And we look at diagrams, take GPS readings, and talk about pipe paths that will carry water from the borehole to the new cistern and eventually to many more public water taps. And all of it is a beautiful sight.